With the high speed of replacement of electronic products and the dwindling of non-renewable resources, more and more people begin to pay attention to the electronics recycling industry. Walking in a residential area, you will find people sitting on the road side with the billboard of home electric appliance recycling. Japanese is using the recycled aluminum, iron and other resources to build their own "urban mines". Compared with the country which only uses their nature resources, Japanese is wiser. The magnetic separator is equipment used on recycling industry to distinguish the ferrous and non-ferrous, copper, aluminum and plastic. Their work mainly depends on the function of magnetic force and alternating magnetic field. There are hard magnet and soft magnet. The magnet used on separator is hard magnet. 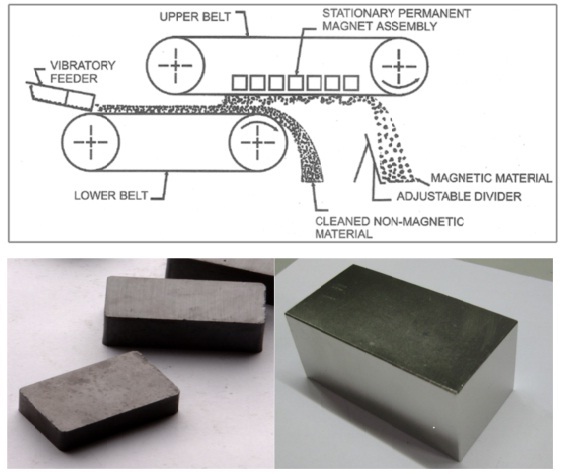 Hard magnet is classified into five categories: sintered NdFeB, bonded NdFeB, ferrite, samarium cobalt, Alnico. Only strong magnetic force can separate metal and non-metal apart. According to this, separator magnet is generally sintered NdFeB. At the same time, to consider magnet cost, big block ferrite is also an option. Samarium cobalt, alnico, and bonded NdFeB are not strong enough on magnetic force and high cost, so don’t in considering the scope. 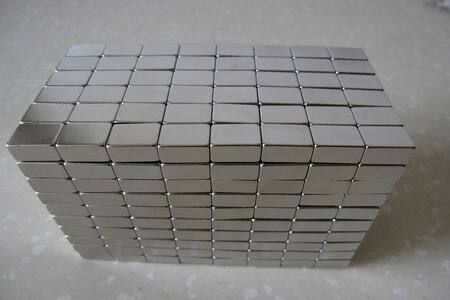 The shape of separator magnet is block. Like ferrite, the size is 6” x 4” x 1”. The size of Sintered NdFeB depends on the design of Magnetic Equipment Manufacturer. Every company will choose size and grade of permanent magnet according to their application.